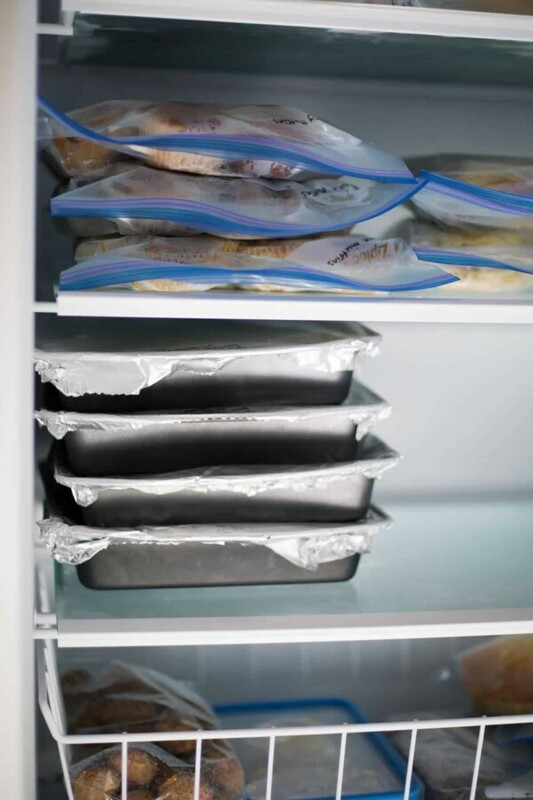 Spilling all the details on the recipes I’ve stocked my freezer with before baby arrives! 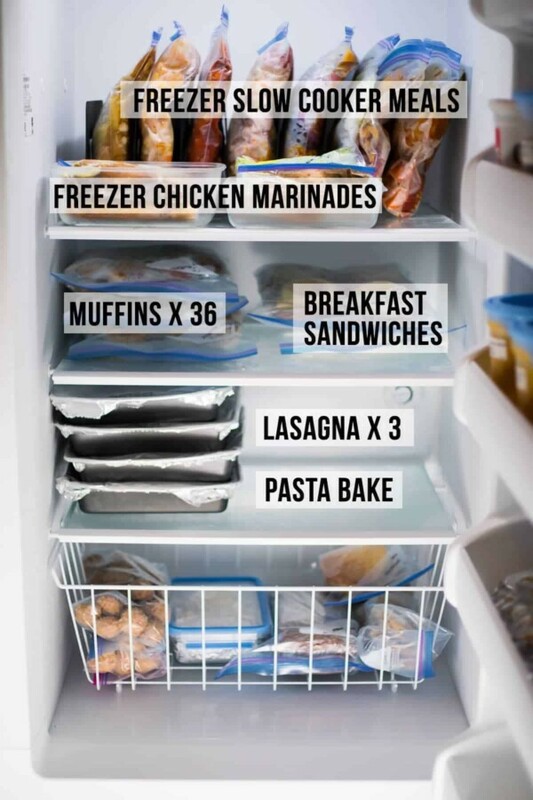 Lots of easy and healthy freezer meal ideas! Popping by today, somewhat unplanned. 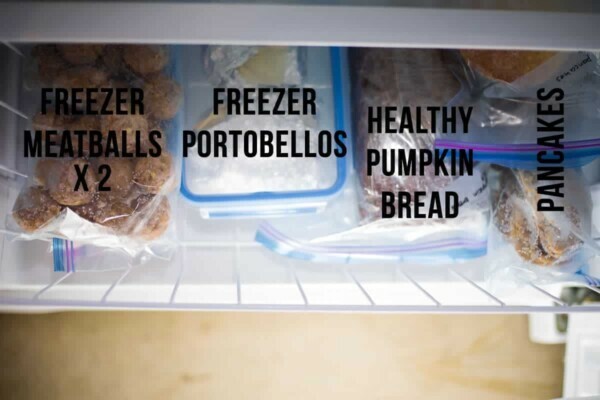 The other day, I shared my freezer-stocking efforts on my Instagram stories, and there were some questions and e-mails, and general interest in the recipes I used. So I thought it would be worth writing up a quick blog post to share with you the recipes I’ve used to stock it up. The first five recipes were batch prepped in 2 hours, and the rest I’ve added in when I had a minute or two to spare. The Ethiopian Chicken Stew and Sweet Potato Chicken Curry require pre-cooking but I am so in love with the extra flavor it gives that this doesn’t bother me. 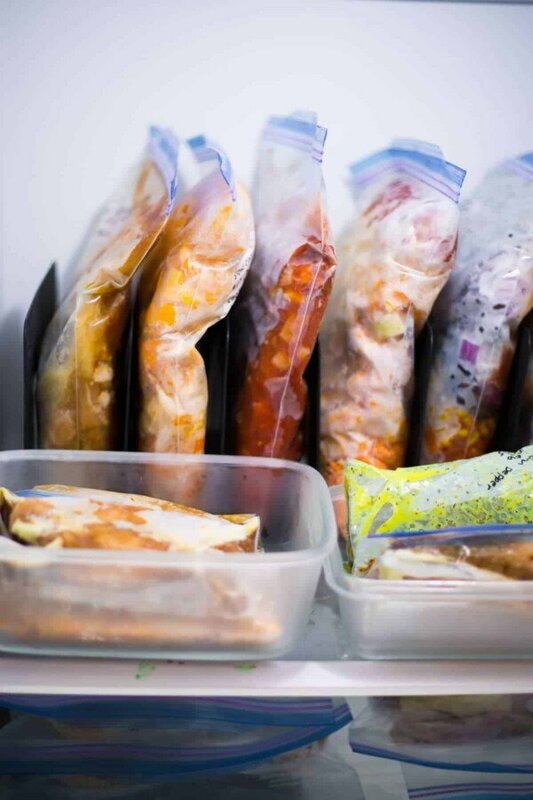 The MOST popular post on my site is this 7 Freezer Chicken Marinade Recipes post…so popular that I decided to do another post with 7 More Freezer Friendly Chicken Breast Marinades. So this photo is showing the freezer stocked with my experiments. You can check out the final product on the links above! Nursing works up a huge appetite, and I’m sure there will be days when my yogurt + fruit + granola won’t cut it. I’ve stocked up with a double batch of these Healthy Freezer Breakfast Sandwiches, which are so filling. Also check out these Mushroom Bacon Freezer Breakfast Sandwiches and stay tuned for a Herbed Cauliflower Freezer Breakfast Sandwich recipe coming your way this fall! I’m rarely up for the effort involved in making lasagna, but I wanted to have some special dinners waiting for us. I used my go-to recipe on Allrecipes. It’s not healthy, requires a bit of effort, but is SO tasty! FYI I reduce the salt in this recipe by 1/3. Testing a Tuscan Chicken Pasta Bake for a post in December. It’s super tasty baked fresh but I’m hoping it can be the type you can pop right in the oven from frozen. Will keep you posted 😉 UPDATE: it can be baked from frozen too! The drawer is a mix up of a whole bunch of different recipes! I made the hoisin ginger and the Italian turkey meatballs from this Baked Turkey Meatballs 7 Ways. They are super fast to thaw, and easy to plan a meal around. One of my most popular recipes from this year are these Lasagna Stuffed Portobellos…can’t wait to pop these in the oven (completely frozen!) and enjoy them for lunch or dinner one day. Love this recipe from my girl Natalie at Tastes Lovely…I made a double batch and froze one loaf. It’s perfect with a cup of coffee or tea. For a recipe that hasn’t been perfected yet. I’ll have to keep working on it, but leftover pancakes freeze great and make for a great breakfast or snack! I love love love eating soup for lunch, and seeing as we’re heading into fall/winter weather, it will be nice to have a soup supply on hand. I made the cranberry, lime & coconut and the trail mix energy bites from this post of No Bake Energy Bites 7 Ways, as well as these new Nut-Free Energy Bites! That’s it! I still have some space, and will probably add a few odd and ends in there. Let me know if you have any questions about these recipes or the products I used to stock the freezer! Thanks for this post. I’m pregnant with my first and one of the things that’s high on my wishlist is banking a bunch of meals to make it easier once baby arrives. I’m curious based on your experience with round #1 how long you’re planning for this stash to last you? 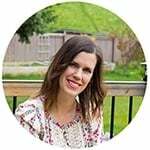 I’m relatively new to your website, but I love your approach to cooking and flavours. 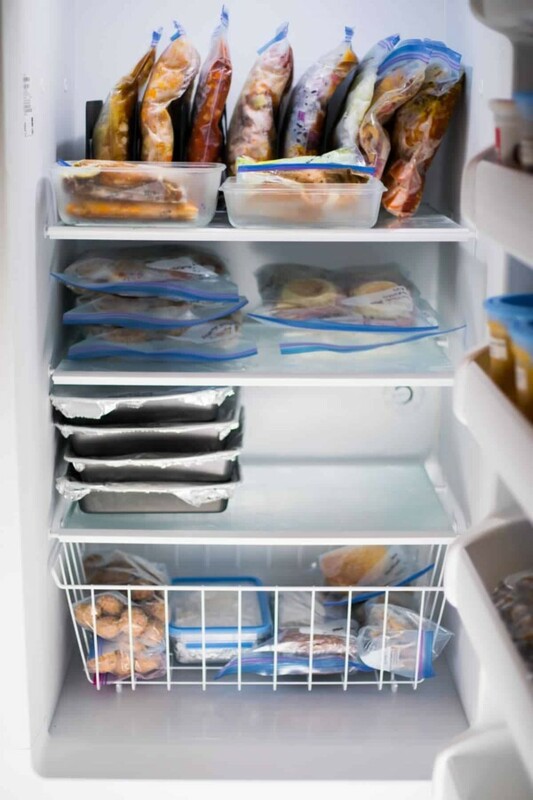 I’ve pinned so many recipes to make when I start my freezer stash! Hi Julia! Congratulations on your pregnancy! When Kai was born I think we had maybe 5 or so meals and we blew through them so quickly. This time I’m aiming for more like 20-30. This might be excessive, but I think we’ll eat our way through them! 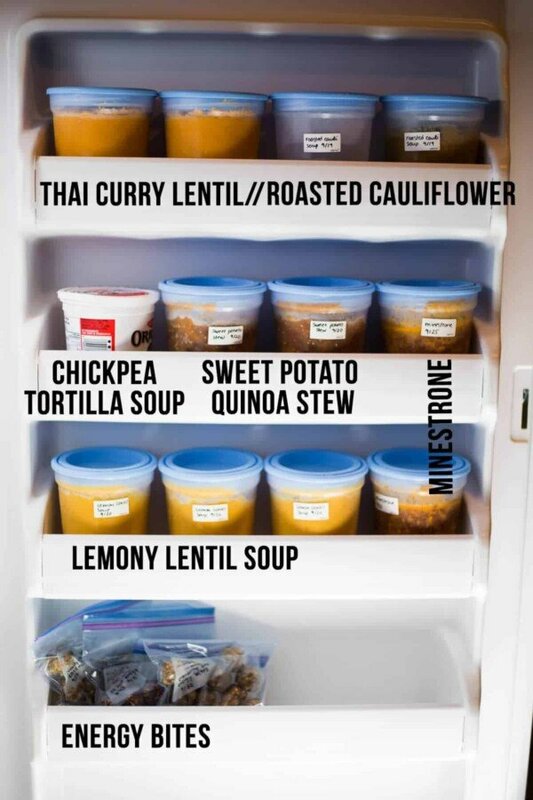 Some are full meals and some are just meal components, but having at least part of dinner planned out is so helpful.